Charles Franklin, director of the Law School Poll, goes "On the Issues" with Mike Gousha in the Lubar Center at the university law school. 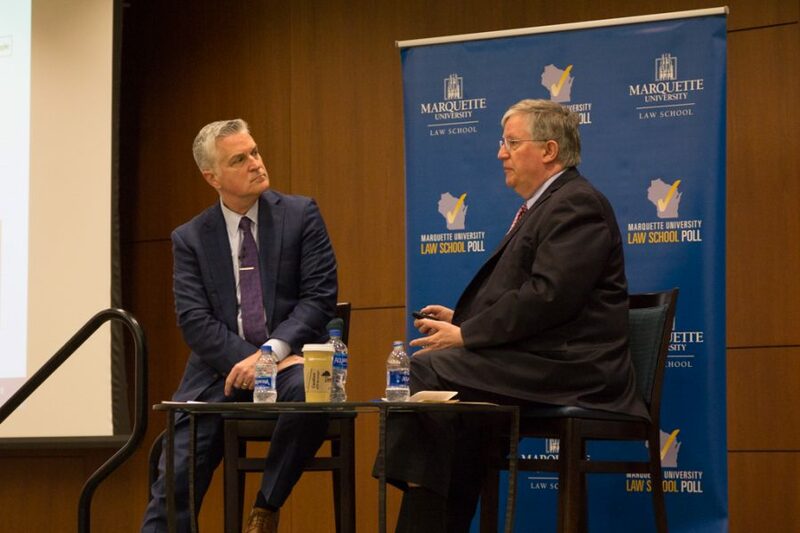 Charles Franklin, director of the Marquette Law School Poll, went “On the Issues” with Mike Gousha April 10 at the Marquette University Law School Lubar Center to discuss the results of the new statewide poll conducted by the law school, which measured data for topics ranging from President Donald Trump’s approval rating to opinions on Gov. Evers’ public policies and the legislature. The poll was conducted April 3-7 after the Wisconsin spring elections. There were 800 registered voters surveyed, with a margin of error of plus or minus four percentage points. 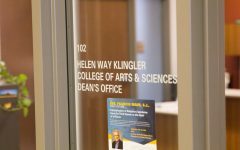 Voter opinion has shifted geographically, causing more Republican views to be present in the Law School Poll, Franklin said. “This shift has raised questions about what it is happening, or is it something about the polls?,” Franklin said. Gousha questioned Franklin about past political races and how well the Law School Poll has predicted the outcome. Franklin said for Gov. 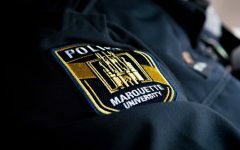 Tony Evers’ election, the Marquette poll was off one point from the actual statewide results. 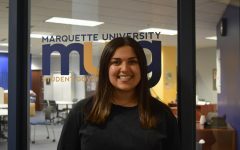 Gousha shifted topics to the poll’s findings regarding the changes in evaluations of President Donald Trump. According to the poll, 46 percent of registered voters currently approve of the job President Trump is doing as a president while 52 percent disapproved. In January, 44 percent approved of the president. Twenty-eight percent of voters said they would vote to re-elect Trump, showing a one percent increase since January, according to the poll. Gousha questioned the reactions to the federal investigation by special counsel Robert Mueller and the confidence Wisconsinites had in the investigation. The polls showed 42 percent of voters thought the Mueller investigation was fair and impartial, showing an increase in confidence in the investigation since October, when voters polled were 31 percent confident. Franklin said confidence in the Mueller investigation rose among Republicans and Independents, while it declined among Democrats. In addition, the polls showed 60 percent of people thought Russia interfered with the 2016 presidential election. Franklin said that among current Democratic presidential candidates, the polls revealed Sen. Bernie Sanders as the top choice with 32 percent and Joe Biden as a close second with 29 percent. Sen. Elizabeth Warren came as the third presidential pick with 17 percent. In January, Biden was the top choice with 32 percent, while Sanders was at 23 percent and Warren at 15 percent. 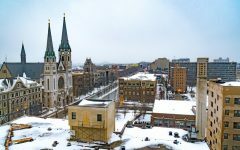 The polls also measured opinions on Evers’ public policies and the legislature. After three months in office, the polls showed Evers’ approval at 47 percent and disapproval at 37 percent. Fifty percent said they approve of the job the Wisconsin legislature is doing. State issues and public policies were also discussed, including marijuana legalization, voucher schools, gas taxes and the minimum wage. According to the poll, 59 percent of voters said marijuana use should be legal and 83 percent said use of marijuana for medical purposes with a doctor’s prescription should be legal. 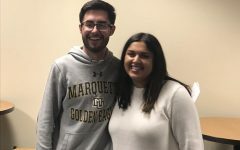 Hannah Jones, a junior in the College of Health Sciences and who follows the polls, said this issue was one she always had interest in because she hears differing opinions constantly. “It’s surprising to see so much support for medical marijuana because I still find people in the medical field refusing to use it or suggest it for treatment,” Jones said. 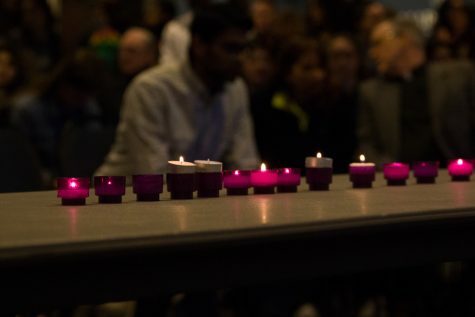 The polls also showed a 41 percent support for a freeze on the number of students in voucher schools and a suspension of new independent charter schools, while 46 percent opposed. Franklin said opinion has shifted negatively on Foxconn, a Taiwanese technology company that chose acres of land in Mount Pleasant,Wisconsin to build a new manufacturing plant. 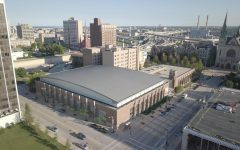 41 percent of voters said the project is worth its cost, while 47 opposed, thinking the project will cost more than it is worth.